In a recent talk on ajax performance, Douglas Crockford explained the practice of “streamlining” code as including algorithm replacement, work avoidance and code removal. Applying this to page load time and performance, browser “work” can be avoided by reducing the number of HTTP requests made. In the most common case this can mean eliminating images entirely from a design, or reducing multiple image references to a single sprite image where possible. Shaving off image requests is a wonderful way to incrementally improve both perceived and measured performance. The use of sprites alone is not a new technique, but the approach taken in this case involves a low-cost, low-risk update to a common component based on legacy code, reduces the number of HTTP requests and simultaneously improves the UI – all good things! Flickr has UI components and widgets which have worked well for years, but can also benefit from newer development techniques such as sprite-based images. Rounded-corner dialogs including alpha-transparent drop-shadows are two prime examples, obvious subjects for optimization. There is some risk in modifying code which may be used in hundreds of places, so minimizing changes to the HTML structure is important. In this particular case, legacy table-based code was used to do layout for a rounded-corner dialog, and a separate table element was used to position a drop-shadow underneath it. 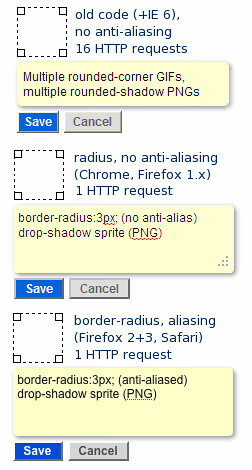 Both elements used separate images for each edge of the box, resulting in eight HTTP requests for the dialog and another eight for the shadow. In modifying the drop-shadow code while maintaining backwards-compatibility, the src property of each corner image was set to a transparent 1×1 GIF image; width and height were already specified on these elements, so the layout is retained as if the original image were being used. Additionally, a CSS class applied the sprite as a background image and a second class provided the background-position offset. While not as “clean” as a complete code rewrite, this incremental approach improved performance and did so with minimal chance of introducing bugs in a global component. Some helpful, free tools were used in creating both the sprite and CSS for these performance tweaks. Upload a .zip of images, set some parameters, and get a sprite with the CSS generated automagically! Quite handy. This entry was posted in Uncategorized by Scott Schiller. Bookmark the permalink.